Ok, So I had this painfully plain bedroom...pale pink walls, old dusty blue carpet, white trim, square windows...just painfully, painfully, plain. I belly dance, play middle eastern drum, and involve myself in all things crafty...so it was time for a change! I had a few influences...belly dance, an old 1949 illustrated copy of the 1001 Arabian Nights, and...I'm a bit red in the face to admit...but...the packaging that some Kama Sutra brand intimate products came in. So! 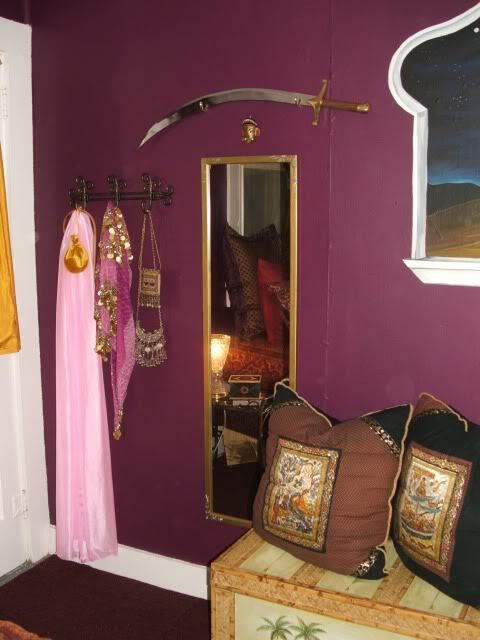 All of those inspirations led to the boudoir-harem fantasy mayhem in this pictures. 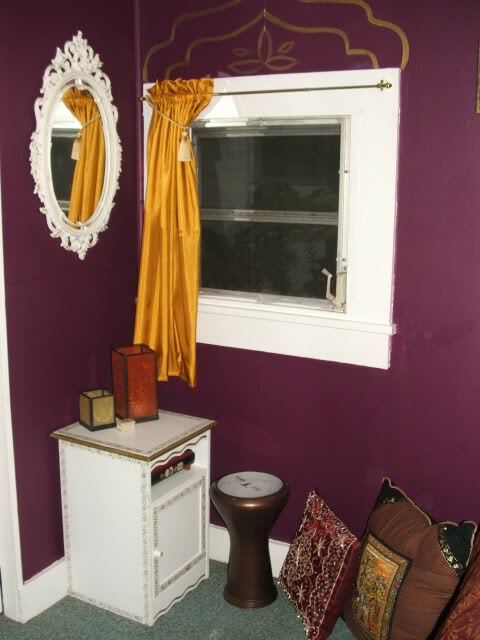 I was going for the tacky-gypsy-hookah lounge look, so any clashing is purely purposeful. I will defend my curtains though, they look yellow in the pictures, but they are gold Thai silk and the flash made them look too bright. They are much darker in person. 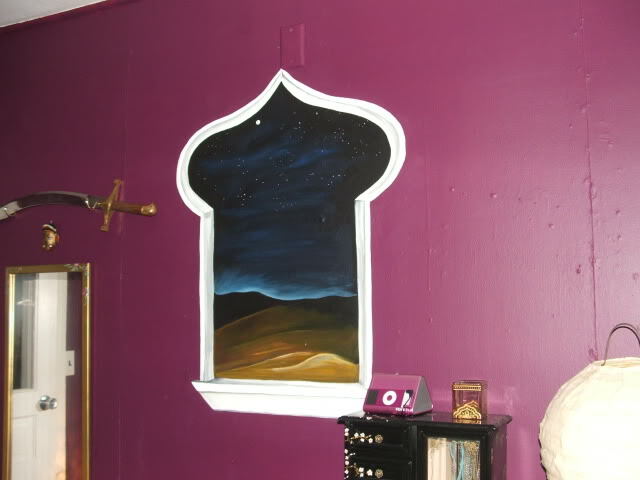 I painted the walls this wine color. In the daylight it looks more purple, with my lamps on it looks more red. 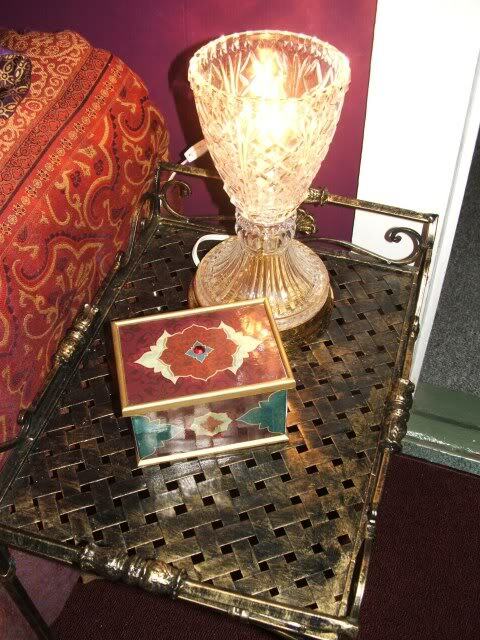 The gold design over the windows came from a design that was painted on a Partylite votive holder my aunt gave me. The majority of the bedding came from the Artesia line at JCPenny, but the curtains are my handy work. 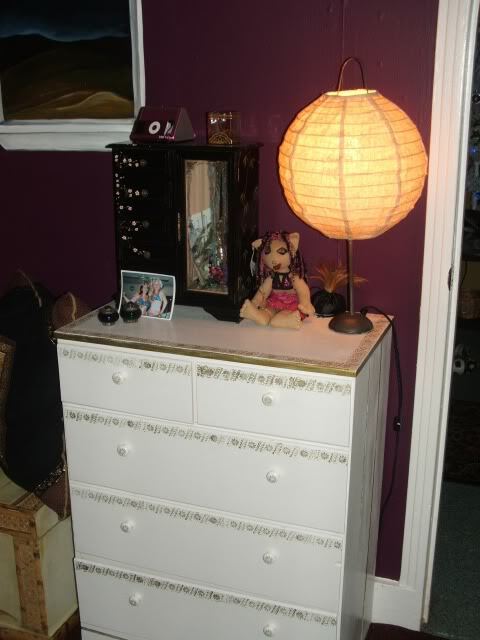 The little gold shelf by the bed holds some of those Kama Sutra massage oils I mentioned earlier. Hey, it is a boudoir after all! Ever watch I Dream of Jeannie when they show the inside of her bottle? She had so many cushions! I have 14 cushions in this room alone. I'll probably end up adding more someday. 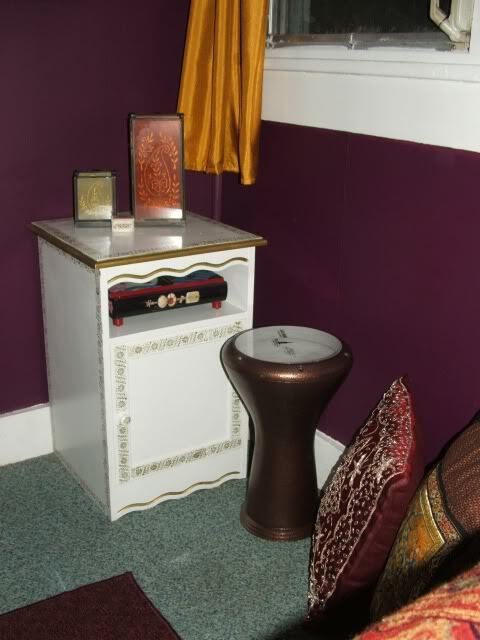 A corner where I can drum, put on some make-up or enjoy some aroma therapy candles. 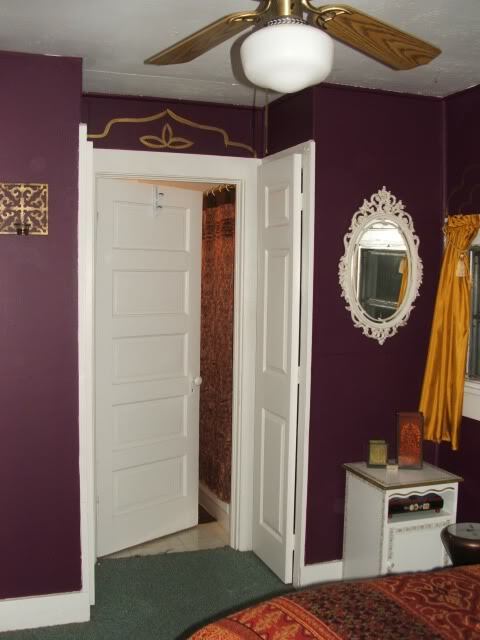 I also have candle sconces on the walls. This little cabinet thingie I painted white and then took a henna stencil and applied henna with cosmetic gold dust to stain a pretty design on its surfaces. That was a trying project...but definitely worth it! I did the same to my dresser. My dressing/dance corner. 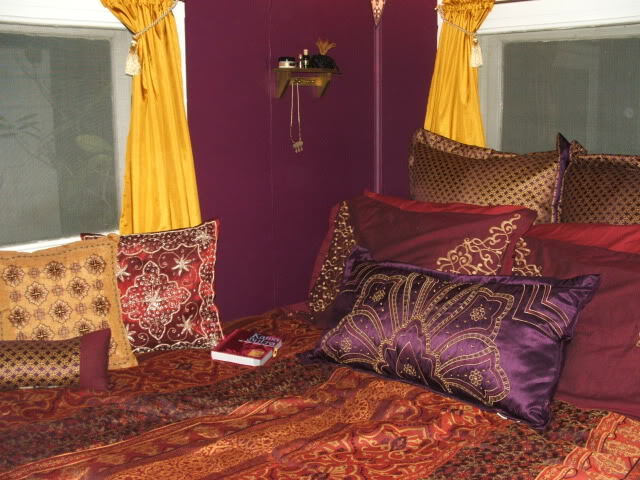 I put some of my belly dance gear here, and in the trunk that the cushions are on. Oh yeah, I made those too. 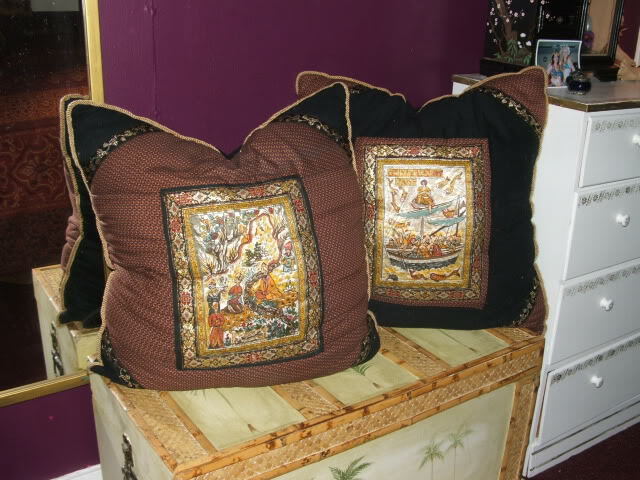 I made these with vintage drapery fabric that was my grandmas. 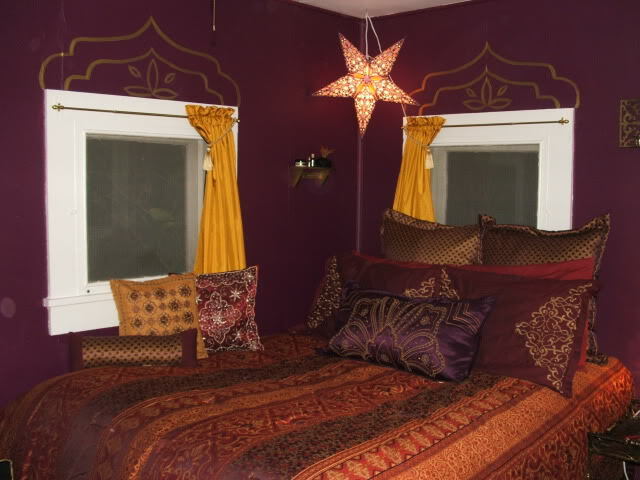 Does your bedroom overlook the sun swept deserts of Rājasthān? Thanks to some acrylic paint...mine does! The moon and stars glow in the dark. I used a star map so the constellations are as correct as I could paint them. I'm a nerd. I did a lot of this antiquing finish to all the candle sconces and this wrought iron garden table with some gold acrylic paint. What a gorgeous room - I love all the rich colours and the fake window is a terrific touch. Beautiful work. Can you do my bedroom next, pretty please? Seriously, this looks so awesome, and the attention to detail really shows, especially with the painting of the window overlooking the desert! I love it! My daughter and I are both in love with your room. We wanted to try this theme in her room, but have not been able to pull it off yet. We are not allowed to paint and I haven't been able to work out the whole washer/dryer/deepfreeze/furnace/waterheater into the decor, so we put it on hold for now. Maybe we need to give it another try. Oh my god that is gorgeous! I love all those colors and that is exactly how I want to do my room. Totally gonna copy you! Mwahahahaha!!! Really cool. Love your room! "I'll fix dinner right after I _______ this! You fill in the blank: sew, hammer, glue, tack, press, cut, etch, tie, paint, draw, color, iron, solder, grout, saw, cross stitch, bend, stain, wire, build, weave. Everything is beautiful and works really well together. I love that fake window, as well as all the detail above the real windows.